If you’re looking for top-quality aggregates at surprisingly low prices, then you’re in the right place! Colson supply a wide range of domestic and commercial aggregates to an even wider variety of customers across Nottingham, Derby and Leicester. 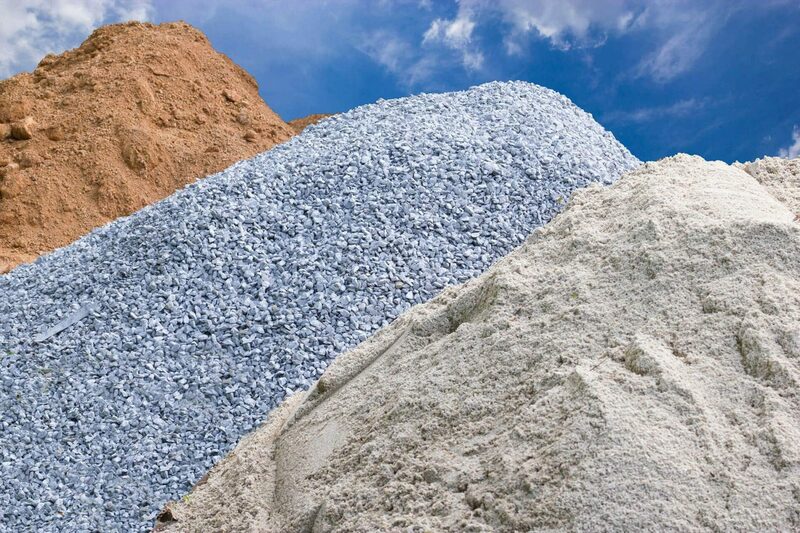 Your aggregates can be supplied in any quantities required, so whether you need top soil for the garden or building sand for your construction site you’ll find what you’re looking for here. Call us with your requirements or use the contact form below. GENERAL In these conditions: "Owner" means Colson Transport Ltd. "Hirer" means the person or company using the services of the Owner in respect to the hire of skips and disposal of contents or sale of materials. "Vehicle" means the vehicle which is delivering or collecting the skip which is the subject of the contract. "Driver" means the driver of the Vehicle. "Site" means the place where the skip is deposited on the direction of the Hirer. These conditions apply to all skip hire contracts with the Owner. The booking, instruction to deliver or use of the skip (including the placing of any object in the skip) by the Hirer or anyone acting on their behalf, whichever is earliest, indicates acceptance of these conditions. The Owner may without prior notice collect the skip at any time should any of these conditions be breached. The Hirer's attention is drawn to the limitation of liability below and in conditions 1, 2 and 4. A signature is not required upon any documentation as proof of delivery or collection of skips or goods; however these terms and conditions still apply. These conditions may not be altered or varied unless authorised in writing by the Owner. The Owner will use its reasonable endeavours to comply with the Hirer's requirements. The Owner will not be liable in any way for any delay or failure to perform its obligations, or any loss, damage or delay incurred by the Hirer resulting from circumstances beyond the Owner's reasonable control which will include, without limitation, labour disturbance, accident, failure of services, breakdown of plant or machinery, fire or flood, acts of God, unforeseen or abnormal conditions or by any act or neglect on the part of the Hirer. 1. Drivers are instructed not to drive over footpaths, drives, grass verges or other soft or landscaped ground and not to lift skips over walls/fences or other barriers or obstructions nor to place skips onto raised embankments. Should the Hirer request the Driver to do so and damage is caused (other than death or personal injury due to the negligence of the Owner) the Owner will not be liable, and should damage be caused to the Owner’s Vehicle the Hirer will be responsible. The Hirer is advised to protect paving slabs, manhole covers and other protective or superficial covers as boards are not provided by the Owner. Vehicles have access criteria as follows: entrance at least 3.10 m wide, 3.90 m high; an access and Site surface capable of withstanding 18 tonnes; and a safe and adequate turning / manoeuvring / working area. Should the access criteria be less than above, the Hirer shall be responsible for any damage caused. The Hirer undertakes to direct the Driver where to deposit the skip, the Driver being for the purpose of such deposit the agent of the Hirer. 2. Except as specifically otherwise agreed in writing the Owner shall be under no obligation to deposit the skip anywhere other than on a highway. The Hirer shall keep the Owner indemnified against any claim, demand or penalty arising out of the presence of the skip (except for personal injury or death due to the negligence of the Owner). 3. The Hirer shall direct the Driver where to deposit or pick up the skip. 4. Where the Driver is directed to deposit or pick up the skip on or from a Site which is off a highway the Owner shall be under no liability whatsoever to the Hirer for any damage caused whilst the Vehicle is off the highway. Without prejudice to paragraph 2 above, the Hirer shall keep the Owner indemnified against any claim or demand which could not have been made had the Driver not been so directed. The Hirer will compensate the Owner for any damage to the Vehicle or the skip which would not have occurred had the Driver not been so directed and which is not due to any negligent driving on the part of the Driver. 5. The Hirer shall ensure that all permissions required have been obtained before skips can lawfully be deposited on the Site, including the permission required under the Highways Act 1980, have been or will be obtained before he directs the Driver to deposit the skip. The Owner can organise permits on behalf of the Hirer (at least 48hrs prior notice required) from the relevant authority at an additional cost to the Hirer. 6. The Hirer shall not move the skip from the Site without the consent of the Owner. The responsibility for the skip remains with the Hirer until collected by the Owner’s Vehicle. Any skips which are removed whilst in the control of the Hirer will be charged at the entire replacement value. Asbestos, tyres, liquid containers/drums/barrels/cartons (even if empty), liquids, liquid paint, lead acid/vehicle batteries, gas cylinders, fridges/freezers, televisions, computer monitors/fluorescent tubes, any form of special, difficult or hazardous waste. Plasterboard must be segregated from other waste in the skip by either placing it on top of the other waste in the skip where it may be easily lifted off or placed into a dumpy bag which can be provided on request. The Owner reserves the right to charge additional charges to the hirer for any of the above waste items deposited in the skip or waste containers. a) the skip is properly sited in accordance with the permission given. b) the skip is properly lit during darkness. The Hirer is at all times responsible for the safeguarding and lighting of the skip. The Hirer must at all times take all reasonable precautions to guard the skip. c) fires are not lit in or near to the skip. The Hirer shall reimburse the Owner for any loss or damage whatsoever or howsoever caused to the skip by fire, accident, mechanical excavators or any other cause, whilst on hire to them. d) the skip is filled no higher than the top of its sides. The Hirer is responsible for ensuring that at all times the skip is loaded safely and that the area around the skip is kept safe and tidy. Should the skip be found to be overloaded it is the Hirer's responsibility to correct the situation. However, the Owner reserves the right to remove any objects that it feels may jeopardize the safe transportation of the skip. Any extra costs incurred in removing, transporting or disposing of the contents of the skip will be charged to the Hirer. The Owner reserves the right to decline collection of overloaded skips. Excess charges are levied in the event of overloading. e) the skip is not to be moved once placed on Site without prior consent of the Owner. The movement of skips on Site could result in the inability to collect the skip. The Hirer accepts responsibility for any damage or extra costs incurred due to the skip being moved. 8. Except as otherwise agreed in writing the Hirer shall fill the skip within the period of hire (hire period being 10 days unless agreed with the Owner) and shall inform the Owner in good time of its readiness for collection or replacement. 9. The Owner will remove or reposition the skip if required at any time to do so by a highway authority or a constable in uniform under section 140 of the Highways Act 1980. 10. Except as specifically otherwise agreed in writing the Owner agrees to dispose of the contents of the skip. 11. Non-account terms: Payment is due on delivery and to be made in accordance with the invoice or as otherwise agreed. Hire periods are up to 10 days, unless otherwise agreed by the Owner. Skips will not be removed from Site until payment is received in full. 12. Account Terms: Payment is due 30 days from the end of the month in which the goods or services are supplied and to be made in accordance with the invoice sent or as otherwise agreed. Credit arrangements are subject to the granting of approved credit accounts and are at the discretion of the Company. The Company reserves the right to insist upon payment before delivery if the Customer’s credit is not satisfactory or if payment of any sum owed by the Customer to the Company is overdue. In addition, the Company reserves the right to charge the Customer 8% per annum above the base rate of the Company’s bank (at the time of acceptance) for overdue payments and to withhold further deliveries or to cancel any unexecuted portion of any orders with the Company. The company also reserves the right to charge the customer for any and all costs incurred by the Company recovering overdue payments. The Customer shall under no circumstances be entitled to withhold payment. 13. The maximum rental period is 10 days unless otherwise agreed with the owner. It is the responsibility of the Hirer to request the collection within this time. Failure to do so will result in an unannounced collection and/or rental charges being incurred.